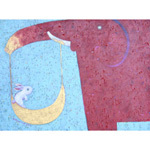 A white rabbit plays on the swing held by its pachyderm friend. Supachet captures the close bond between these two companions with acrylics. Painted and signed by the artist in 2011. The rabbit and the moon is a theme that explores the relationship between Supachet and his creativity. It tells of his fear of losing creativity as the result of increasing burdens in making a living. 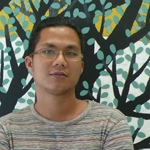 He wants to preserve his own imagination as long as possible as it is the most important part of creating his artworks. This item will be shipped rolled. Color discrepancies may occur between this item and your computer screen.